Review - Why Does Inequality Matter? In his new book, the eminent moral philosopher T.M. Scanlon focusses on the topic of inequality and why it should matter to us. Indeed, on the face of it, inequality is a moral term with explosive political power that fuelled revolutions in the past. In the 18th century, the philosopher Jean-Jacques Rousseau wrote in his book The Social Contract very succinctly: "Man is born free; and everywhere he is in chains. One thinks himself the master of others, and still remains a greater slave then they". Men are born as equals, but inequality is rampant. These words were the prelude to game-changing revolutions in the American colonies and France, ushering in the modern world under the flags of liberty, equality and fraternity. Egalitarian reasons are reasons for objecting to the difference between what some persons have and what other persons have – and for reducing this difference. Some recent philosophers have started to question the concern with equality and argued that those concerns seem difficult to justify. Robert Nozick famously argued that a concern with equality is a concern with a particular pattern of distribution which can be maintained only by interfering with the liberty of individuals to make choices, take risks, and enter into contract with each other. Why should we tolerate the constant interference with individual liberties to uphold an arbitrary pattern of distribution? And why should people be concerned with the difference between their lives and the lives of others? Isn't this just an expression of envy that the "have nots" feel towards the "haves"? 6. it arises from economic institutions that are unfair view to the inequality of income and wealth. Scanlon's book gives an insightful discussion of all of these reasons for objecting to inequality, pointing out the differences among these reasons and their respective consequences. All the while, Scanlon presupposes one important idea of equality, what he calls basic moral equality – the idea that everyone counts morally, regardless of differences such as their race, their gender, and where they live. This idea of equal human rights is in Scanlon's terms "perhaps the most important form of moral progress over the centuries." (p. 4). But – as one might put it – the more "interesting" arguments begin where the basic structure of society and its social institutions make room for some forms of inequality in the distribution of social benefits and advantages which can be justified on the basis of certain reasons. Scanlon obviously has his own theory about what these certain reasons are that might justify inequalities in the basic social structure of societies. Scanlon is famous for arguing for his own formulation of contractualism, the idea that moral principles such as "right" and "wrong" derive their legitimacy and justification from the special situation of rational beings being motivated to regulate their conduct on the basis of regulations that they both can agree to. As Scanlon put it: "It (contractualism) holds that an act is wrong if its performance under the circumstances would be disallowed by any set of principles for the general regulation of behaviour that no one could reasonably reject as a basis for informed, unforced general agreement.". The idea behind this contractualism is that if our aim is to be able to justify our behaviour and conduct to other fellow human beings, we will want it to conform to principles that none of our fellow human beings could reasonably reject. The same holds true with a view to the potentially justifiable patterns of inequality in our societies. Inequalities within our society are justifiable if and only if they can conform to principles that none of the participating individuals could reasonably reject. 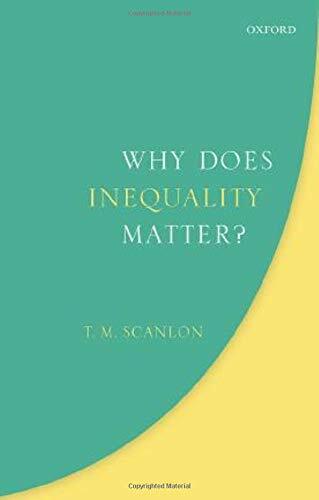 In a series of illuminating chapters, Scanlon analyses the reasons behind some forms of inequality and tries to distil the justifiable and legitimate reasons from the non-justifiable and illegitimate reasons for inequalities. In chapters such as "equal concern", "status inequality", "procedural fairness", "substantive opportunity", "political fairness", "equality, liberty, and coercion", "desert", and "unequal income", Scanlon ponders the different issues and highlights the controversial issues. Scanlon might have drawn criticism in the past because his theory of contractualism narrowly focussed on the individual moral level and neglected to some extant the level of social institutions and politics. With his new book "Why does inequality matter? ", Scanlon disproves these criticisms. Social institutions and their justifiability within his contractualist theory draw centre stage and he shows how his contractualism can be applied to these levels of social theorizing. Moreover, in his chapter "political fairness" Scanlon is starting to draw the basic elements of his political philosophy, which needs clearly to be spelled out in much more detail, but nevertheless is showing the groundwork and the pillars upon which it is build. "Why does inequality matter?" is an insightful book of one of the most interesting moral philosophers living today. With this book, Scanlon ventures into the broader issues of the justifiability of social institutions and questions concerning political legitimacy. As readers already acquainted with Scanlon's earlier works know, Scanlon's essays are characterized by a search for clarity and originality. Scanlon as always critically probes alternatives and builds up strong arguments in favour of his theory. "Why does inequality matter?" is also a book that tests his basic contractualist theory by applying it to larger issues and probing its implications for resolving issues pertaining to questions of equality and inequality of social institutions and political philosophy.